"Taking bus #10, #11, #700, I got off at "Bukgun-dong" stop,..."
Have a question for Bellus Rose Pension? "the host Mrs Park was a very nice and lovely woman." "The room is clean, equipped with cooking facilities, and has little garden." "There is relaxing music from garden in early morning." "The rooms/apartments were spacious, clean and well equipped." 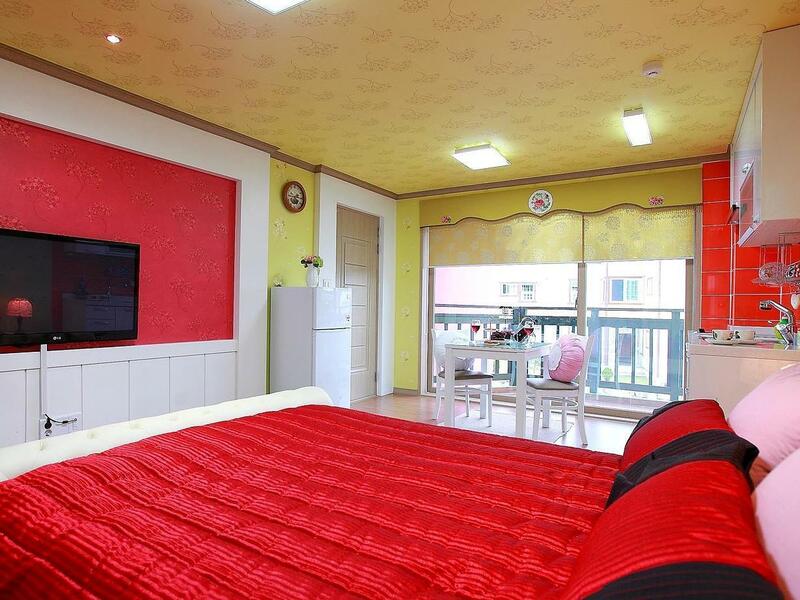 Bellus Rose Pension, located in Bomun-dong, Gyeongju-si, is a popular choice for travelers. The city center is merely 5 km away and the airport can be reached within 40 minutes. For those of you who want to venture out, Bomun Lake, Bomun Tourist Zone, Bunhwangsaji (Bunhwangsa Temple Site) are just some of the attractions available to visitors. Bellus Rose Pension also offers many facilities to enrich your stay in Gyeongju-si. 24-hour room service, free Wi-Fi in all rooms, fireplace, grocery deliveries, taxi service are just a few of the facilities that set Bellus Rose Pension apart from other hotels in the city. The ambiance of Bellus Rose Pension is reflected in every guestroom. television LCD/plasma screen, private pool, internet access – wireless (complimentary), air conditioning, heating are just some of the facilities that can be found throughout the property. The hotel offers wonderful recreational facilities such as outdoor pool, garden to make your stay truly unforgettable. Bellus Rose Pension is a smart choice for travelers to Gyeongju-si, offering a relaxed and hassle-free stay every time. "It is very good service and arrangement for my family." Though it may not be that convenient for those without cars, it is really a lovely place with elegant design and cozy environment. We enjoy our stay there and the host is very nice and proactively give recommendations on scenic spots. Travelled from Seoul to Gyeongju for 2 nights stay. Chose this hotel due to the feedback on Agoda and decided to give it a try. Take bus no.700 from Shinyeongju station to Bukgun-dong (where the pension is located) and it takes another 15 mins walk to the pension. We have sought help from the Shinyeongju Tourist Centre before boarding the bus and to our surprise, the tourist centre has called up the pension owner and they were waiting for us at the Bukgun-dong bus stop when we arrived. The pension was so nice and we had the second floor of the 3 rooms to our group (travelled in the group of 6). Each room has a different theme and it comes with a small kitchen. Mr and Mrs Park has also helped to arrange for BBQ on our first night outside the pension. The only disadvantage of the pension is the walking distance to the bus stop. Overall, it was a great experience and I definitely recommend my friends to stay here. The room is nice and cozy. The owner is friendly and helpful. it is worth to stay far from the downtown as you will see the beautiful view and life style. even it is quite far from the town, you can find a taxi. the pension will make you feel like home rather than the hotel. We were traveling by public transportations (like many young people do). We worried so much if we could find the hotel at night without getting lost (and it was freezing outside). I realized that my concern was unneccessary after getting a call from a staff here. She asked our last destination before check-in, then she picked us up and gave a ride to the hotel. Not only that, the other staff took us to the nearest bus stop next morning after check-out. They answered all of my text messages during the stay immidiately so I could feel very comfortable and informed. And the room has private BBQ station and this was my favorite. A nice, small pension on the outskirts of Gyeongju. The rooms/apartments were spacious, clean and well equipped. They are adequate for self catering. The owner provided a simple but ample breakfast at a very reasonable price. The only problem was to find the place as the Korean GPS did not recognize the address and the phone number of the pension was not included in the list of known phones by the GPS. By the way, Korean GPS features navigation to registered phones that greatly simplifies the insertion of addresses - use this feature even to points nearby the final destination if it is not registered but you can find an institution/museum/national park in the neighbor area whose phone number is registered. Anyhow, the owner came to meet us late in the evening when we lost our destination point and show us the way to the pension. The pension was and comfortable. Breakfast was simple, yet just right. The pension is quite far away from anything, even from the closest bus stop it's about a 10 to 15 min walk. However, the host Mrs Park was a very nice and lovely woman. She offered to give us rides to the bus stop and asked us to call her whenever we came back to the bus stop so she could pick us up. It was very nice of her. Sometimes the timing worked out and sometimes it did not. If you have a car, no worries. If not, just consider the distance to the bus stop. The hostess went above and beyond to show us around and even found vegetarian restaurants nearby. She was always making sure that we didn't get bored and gave us information about the area. The room itself is very big and has a private balcony which we used to eat breakfast in the mornings. Great place, couldn't ask for anything better. The stay in Bellus Rose Pension is a very nice one. I started my tour of Gyeongju before checking in to the Pension. After exploring the Bulguksa temple, I checked with the Tourist Information Centre there to see how I can get to the pension by bus. The staff managed to contact the pension and the owner, Mr. Park, promptly agreed to come to take me to the pension by car! I am really grateful to the enthusiasm shown. When I got to the pension, I was assigned a room on the ground floor. The room decoration is a bit feminine (certainly done by Mrs. Park) but otherwise is clean and tidy. Since I did not have dinner yet, Mrs Park made a couple of recommendation of restaurants and drove me there (near the entry of pension area) while I agreed to walk back myself afterward. The best thing I like is the large High-Definition TV set in my room which has access to lots of channels, local and international. It turned out I could happily enjoy a couple of Barclays Premier League live broadcast that Saturday night! The next morning, I took the breakfast in my room at a small fee. Breakfast is basic with toasts, juice, coffee, yogurt, a boiled egg and banana but is good enough to start a new day. After checking out, Mrs Park drove me to the entry point of the pension area so that I can proceed with my journey. Overall I am very happy with this stay. The pension is some distance from the nearest bus station, but with the owners' kindness and enthusiasm this is not a problem. Also I see a couple of European families staying there drove their rented car. Should I come back to Gyeongju in a warmer season, I will very likely stay in Bellus Rose Pension again. Friendliness of hosts; quiet location close to restaurants; in room breakfast. Comfortable and enjoyable stay. Located in a quiet area, walking distance to a host of local restaurants and transport links to city and tourist sites. Super welcoming hosts creating a warm homely feel. the host Mrs Park could not have been more helpful, or charming. we were driven to the local restaurant street each night, as it was an extremely cold snap. She always made sure we had information on what to visit and how to use public transport to get there. Her breakfasts were fabulous. 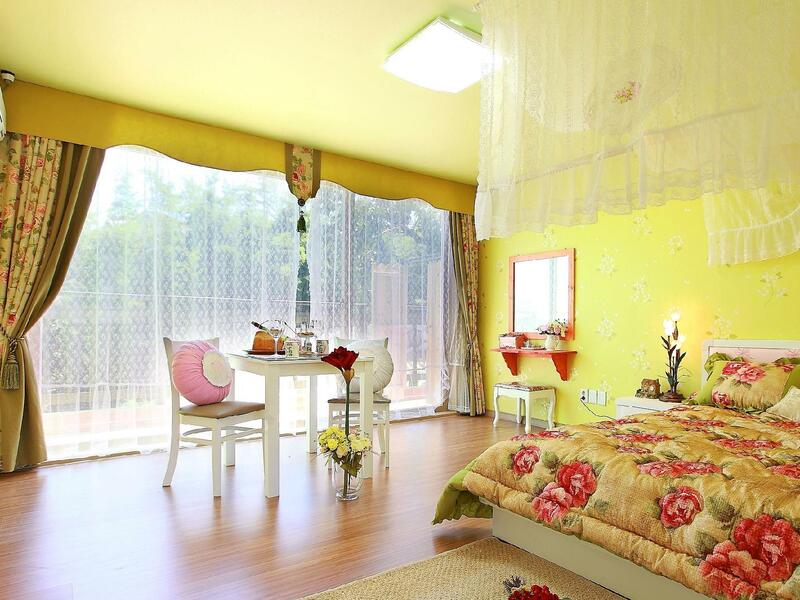 The rooms are delightfully decorated, choose your fav colour! we had a most enjoyable stay. We arrived mid evening and were warmly welcomed by our hosts. Mrs Park was extremely helpful getting us settled and making recommendations for dinner and sight seeing. She even arranged for her husband to be our driver the next day and tour us around to the top sites. He was absolutely delightful and worked really hard to ensure we were comfortable despite seeing the sites at the tail-end of the Japanese typhoon. The rooms were clean and bright. This is a great place to stay! Thank you for everything Bellus Rose Pension - 4 Canadian women travellers. I'm very picky and I loved this hotel. We had a large, clean comfortable room with a deck overlooking a charming garden, a kitchenette, and an immaculate bathroom with a nice not shower. Mr. And Mrs. Park are very warm and helpful. Beautiful Bomun Lake is only about a mile away as are some lovely attractions including a botanical garden conservatory and tropical bird aviary. Downtown Gyeongju is about a 15-minute, $10 - $12 cab ride. TV includes free movies and channels in English. Breakfast is delicious and the laundry service is efficient and inexpensive. The Bellus Rose is an exceptional value and we will be back! Highly recommended. The place is very big and comfortable, and includes a kitchen as well! There was a backyard which looked really beautiful, but sadly it was too cold to stay outside since it was winter. The owner was really friendly and helpful, reccomending us where to go and where to eat, and even offered to fetch us to places when she was going out. I would like to thank the owner once again for helping to bring my girlfriend to the hospital when my girlfriend got gastric flu. She was there the whole time to help us with the hospital administration, translation and making sure everything was well, before bringing us back to the pension. If there is a chance we would love to go back again! My wife and I had a lovely night here and wish it could have been longer. Mrs Park, the owner of the pension, was very attentive and picked us from the train station and dropped us off at the bus station for free. Her English was also fairly good and she made it easy for us to get around. She even delivered us breakfast in bed. It is definitely worth the money and though it is out of town, it actually puts you closer to many of the most famous sites. Highly recommended. Wonderful little pension with good proximity to all the places you want to see. We arrived by train and asked the tourist information center for directions, they called the hotel and the owner came to pick us up from the bus stop. When we got on the bus we told the driver where we were going and he let us know when it was time to get off Lovely service, she was very friendly, and showed us where everything was, what buses we needed to take and the times that it was open. She gave us tips that weren't in any of our tourist books and really made our stay here amazing. They have bikes that you can use to get to the local bus stops, and a great little pool to relax in if you want piece in quiet. We were the only western tourists there, but were really welcomed and we felt quite at home. This is a great location for seeing the sights, and while would of been nice with a car, we had no problems at all with the buses and the owner dropped us off with our luggage at the bus station when it was time to go home, making it painless and easy. The breakfast was about $10 USD per person, but very much worth it. The owner Mr. & Mrs. Park provided very helpful and gracious service throughout our stay . We hire a car from AVIS and the car parking is in front of the house . With the car , go to Busan city about 45 min. The owners of Bellus Rose are friendly, helpful hosts. They picked it's up from the bus station to drive us to the resort when we first arrived. Though the location is inconvenient if you don't have a car, the hospitality makes up for it. If you don't have a car and plan on doing a lot of site seeing, however, i wouldn't recommend it. Rooms are big and clean. They all have a potato or balcony. We were very satisfied with the great spacious rooms and romantic ambience! The customer service provided by Mr and Mrs Park were beyond our expectations! Upon arrival, we were given travel directions to all the tourist attractions and offered numerous car rides to the nearest bus stop for convenience.